Requested by Monica, she told me one of her favorites was Gackt. I too like Gackt. Let's get a little background information on Gackt shall we? 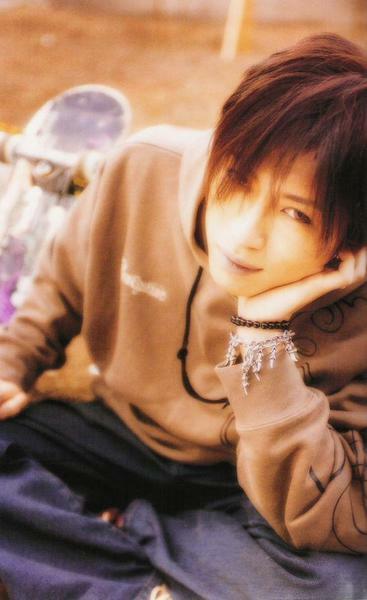 Gackt was born on July 4th 1973. He's a Japanese singer, songwriter, actor and author. He first began in the band Malice Mizer, a Visual Kei band then soon went to do his solo work. He's released 14 albums on his solo career and 39 singles. He's also used in anime's as characters voice overs such as "New fist of the north star", Dirge of Cerebus:Final Fantasy VII and a few others. He co-wrote the movie Moonchild which I have to say is pretty decent and then made his official international debut with Bunraku which I highly suggest you to see. Gackt was born in Okinawa. His father was a music teacher and his mother was also a teacher. Now he said in his autobiography that he was a mischevious child and enjoyed taking risks at the age of 7. There is also the fact that he almost drowned in the Okinawa ocean at that age and claimed that he could see "spirits" of his ancestors from then on. When he was 10 he was hospitalized for a while for a gastrointestinal condition. He made friends with terminally ill children during his stay. Now his schooling of music began at the age of 3 which is sort of expected if either one of your parents is a music teacher. Now let's began to talk about his music. I liked him in Malice Mizer but I think I prefer him more with his solo music. The first time I heard Gackt was when I was 15 and started high school, thus my reintroduction to Japanese Rock, how ever, I don't classify Gackt as Rock and I'll explain why. Gackt has done, ballads, rock and pop and even a little insturmental so I prefer to call him "experimental" which is why I love his work! It's rages from genres and it gives him an oppurtunity to reach out to a more broader audience. Now the first song I heard was "Vanilla" and may I give a fair warning to those with young ears and beginning to learn Japanese...please do not listen to this song due to the "content". Yes vanilla is a pretty "explicit" song if you can catch on to his play on words such as "I want to struggle until I'm deep inside you" and "I am your Vanilla" but let's not get too into detail to that. Another song I was introduced to was "Secret Garden" and "Last Song". From then on I was on my own to explore the world that is Gackt. Now Gackt's acting has gotten a lot better. When I heard Bunraku was coming out I was on my feet to go see it and I honestly have to say get off this site and go watch it!! Gackt's english was outstanding, and I think I even had a fast heart beat going. My favorite part was when he was like "Hey...hey..I'm not looking for a fight". I could tell that Gackt put his heart and soul into acting in this movie and from the little clip I saw on youtube, he also had fun making it. Now a subject I really feel uncomfortable talking about is his "Ex-wife". The rumors that have been flying around is that fans use to beat her up and she couldn't take it anymore and left. Another "rumor" or the truth because I think it was translated somewhere that she was ill and couldn't bare to see him in "pain" at her suffering but the good news is that Gackt has stated that he wants to get married again soon. So let's hope for the best ne? Now finally my favorite song. My favorite song of Gackt's has to be -drum roll-Arittake no Ai de~LLV~. I don't know why but some how when I listen to this song I can't help but imagining a group of friends/family swaying back and forth, sitting in a circle, and singing a long. I always sway back and forth to this song singing a long. . Also, after a long day, like this one it's pretty relaxing in a sense. I give Gackt a 4 out of 5. He's a really good artist and knows his stuff. He's a very very talented pianist and has the voice that can make any girl's heart melt. Sometimes I think he can be a bit full of himself but I am not saying I know this for sure because I have never met him before. Also if he really is a "vampire" as he claimed he is/was (admitted in an interview his true age) then at least he doesn't sparkle. Listed below are my suggested songs for Gackt.